Every year, The Worldheart Foundation offers a firework show to the city of Amsterdam on New Year’s Eve. And it’s not a regular kind of show; every show is dedicated to a special theme, expressing a special symbolism. For 2016/2017 the theme was “The Fire of the Free Mind”. After reading the meaning behind it and seeing how it’s done, you might want to come next year yourself. Already 20 years now, people from the Jordaan area in Amsterdam invite their families to come over and watch the show among some 10,000 other Amsterdammers and tourists. The show always takes place on the bridge at the junction of Bloemgracht and Prinsengracht, across from Westerkerk Church and the Anne Frank House. 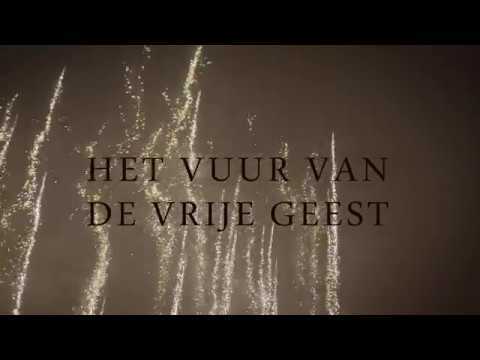 The show is designed and provided by Pyrofoor de Amsterdam B.V.
Video by Amanda Beugeling (Peace and Pixels). Joost R. Ritman, founder of The Ritman Library, talks in the video below about the deed of transfer he and his wife signed to make possible the “Embassy of the Free Mind”. The future location of The Ritman Library in the House with the Heads in Amsterdam will offer a platform to visualize and represent the free mind. Joost R. Ritman talks about the secret of Amsterdam and what made it such a free haven for contrarian thinkers. It is the Fire of the Free Mind that illuminates the heart of man and makes him bear responsibility for his great gift – in the past, as well as in the present and future. Watch the video here and find out why you won’t want to miss at the end of this year! 6. Did we mention Amsterdam is also highly picturesque during the day? Merci beaucoup pour les nouvelles lumineuses du pays.